For 25 years, Versa Products Company’s has supported the Trinity College Fire­ Fighting Home Robot Contest (TCFFHRC) Versa Products Challenge, and the Versa Products Dream Camp Engineering Internship Program. The Trinity College robot contests are open, not-for-profit events that require invention of autonomous, socially relevant robots. The contests promote creativity, teamwork, the understanding and application of STEM subjects, and the sharing of ideas. This contest inspires inventors of all ages and skill levels. 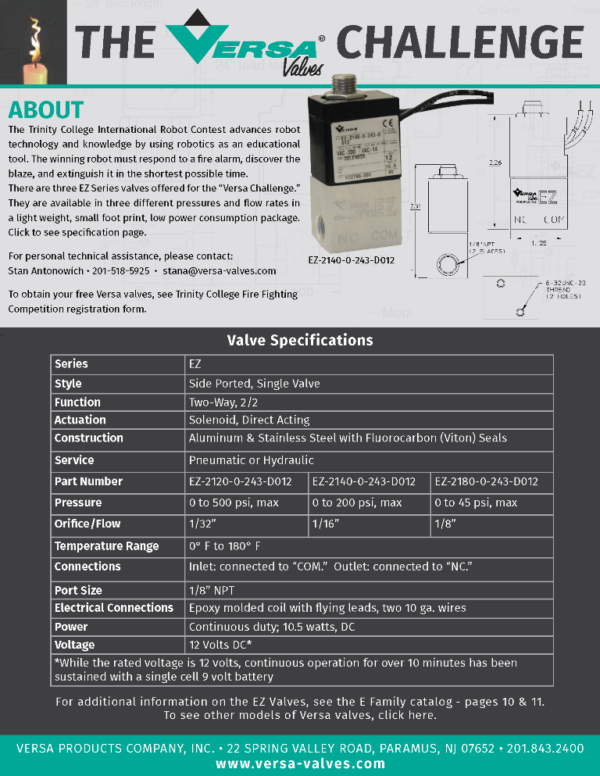 It introduces and promotes the field of engineering and robotics. And, it raises awareness of Trinity’s ABET-accredited Engineering Department. 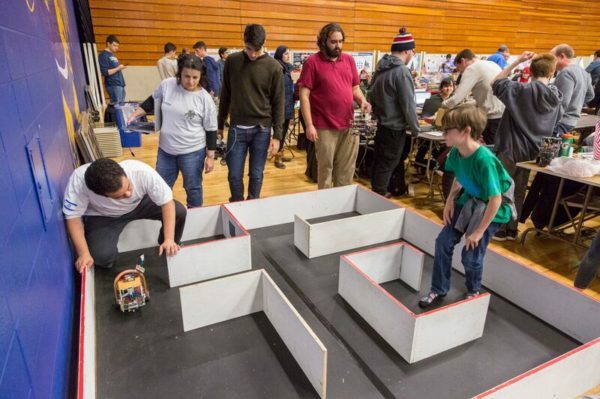 TCFFHRC offers participants an opportunity to invent, design, build, and competitively demonstrate robots that can perform tasks for the good of the public and thus advances it mission. Each year, Trinity awards Versa Products Challenge Prizes to robot entries that place the highest in each division while using Versa Valves. As with past years, a representative of Versa Products is welcome to present the prizes at the award ceremony. Inspired by the competition, the Versa Products Dream Camp Engineering Internship program enables college-level engineering students to mentor some of Hartford’s most underserved yet promising young scientists through the team-oriented process of invention, creation, and execution. For a quarter century, Trinity’s robot contest has attracted inventors from as many as five continents. 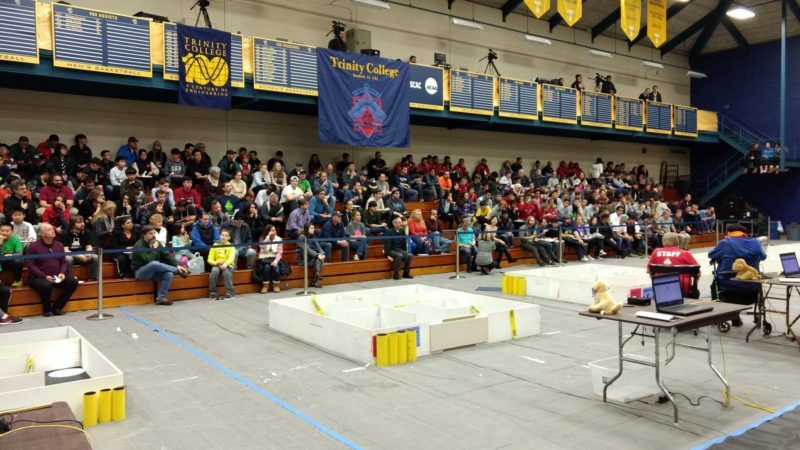 Trinity College has built a premier robotics contest which now serves as a model for contests around the world. This contest provides opportunities for collaboration, information exchange, and community building by facilitating exceptional performance through competition. The main competition takes place over two days with more than 80 robot teams and upwards of 400 people demonstrating their inventions in the contest. The contest attracts teams from the U.S., Portugal, Indonesia, United Arab Emirates, Israel, Canada and China. Israel and China send an average of 10 teams each year. As a point of pride and indication of excellence, since 1999 the Israel Ministry of Education has used fire-fighting robotics as the theme for graduation projects in the country’s best high schools. Since its inception, the contest has also attracted teams from Denmark, United Arab Emirates, Singapore, Palestine, India, South Korea, Portugal, Indonesia, and Argentina. Domestically, participants in Trinity’s robot contest have come from more than 140 different colleges and universities including Pennsylvania State University, M.I.T., Yale, Oklahoma State University, Tufts University, University of Evansville, Hobart and William Smith College, Embry-Riddle Aeronautical University, and Wellesley College as well as a large number of middle school and high school age competitors from New York and Pennsylvania. ln addition to diverse international and collegiate competitors, the contest brings out the best in Trinity College students. First­ year Trinity students build robots and compete as part of the Introduction to Engineering course, ENG 110, as do more advanced Trinity robotics students as part of the extra-curricular Trinity College Robot Team . Students also fill more than 100 volunteer shifts alongside Trinity faculty and a cadre of dedicated alumni. They serve as translators for the international teams and do whatever it takes to ensure the continued success of the program. 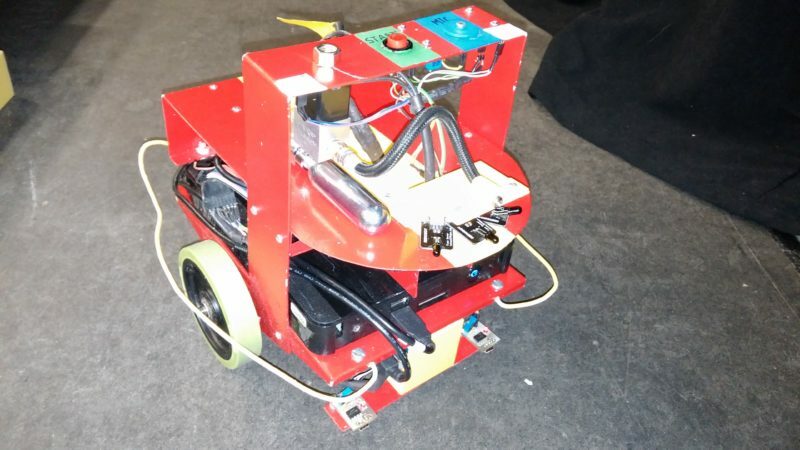 The contest remains a low-cost alternative to other robot competitions, ensuring openness and accessibility to teams of all ages and affiliations. Bringing a diverse group of individuals together, the competition makes it possible for the youngest members, eighth grade students, to participate alongside undergraduate and graduate students, scientists, and professors. The Robot Contest encourages robotics education at high school , college, and university levels around the country and abroad. 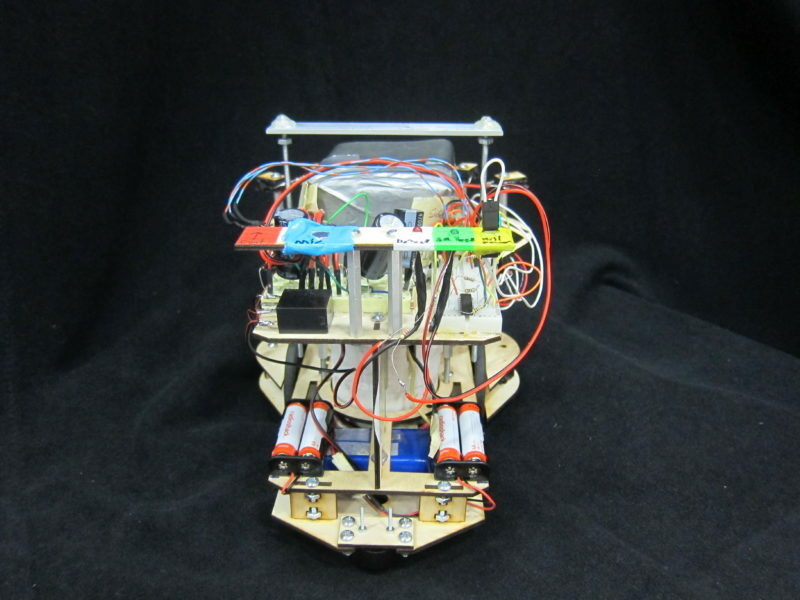 Many engineering programs have adapted the firefighting robot theme in courses, while others have chosen fire-fighting robot design as a focus for senior design projects. Each year Trinity ‘s robot contest inspires hundreds of budding young inventors. New challenges requiring contestants to consider the different dimensions encompassed in the complexities of design and application are added each year. New rules were implemented in 2016 and the contest now includes three levels of competition of increasing difficulty, each robot was allowed to progress upward. Under the new rules, robots must succeed at level 1 in order to advance to level 2, and succeed at level 2 to advance to level 3. Levels 1 and 2 are very similar to the junior and senior levels in 2015. Level 3 includes a new Search and Rescue task, in which the robot must locate a small child (doll), rescue it from the maze, and then return to the maze and extinguish the flames (candles). For the past decade, the robot contest has been a part of with Dream Camp, one of Trinity ‘s most successful urban outreach programs. The high quality and tuition free summer and after-school program provides mentoring and academic enrichment to as many as 250 Hartford public school children between the ages six to sixteen. Dream Campers spend five weeks in June and July on the Trinity College campus engaged in academic, cultural, and athletic activities. The year round program addresses the academic achievement gap and summer learning loss, and is credited with increasing college awareness and enrollment among Hartford’s underserved students. In addition to robotics, Dream Camp’s summer science curriculum has included hands-on science experiments that help campers discover the properties of magnets, electricity, light, and water. Each summer, funds from Versa Products make it possible for Trinity to support two summer interns from the College ‘s ABET-accredited engineering program. The interns implement a five-week curriculum on robotics for Dream Campers entering the fifth and sixth grades. The unit introduces basic robotics principles, computer programming, problem solving, and teamwork skills, inspiring students to enter the robot contest the following spring. The robotics program has been a tremendous success. It is a favorite academic session among Dream Camp participants and provides a positive and rewarding experience for the Trinity students who direct it. Through additional support from the Boehringer Ingelheim Cares Foundation, the Dream Camp robotics curriculum has been expanded into the academic year. In 2018 we will celebrate the 25th anniversary of the Trinity College Fire-Fighting Home Robot Contest (TCFFHRC). Versa Products Challenge is considered one of the premier robotics events in the world. In no other place do such varied contestants from so many places gather to compete. Versa Products’ enduring sponsorship is invaluable as it has sustained engineering education and robotics at all levels and nurtured next generation of engineers and engineering leaders. 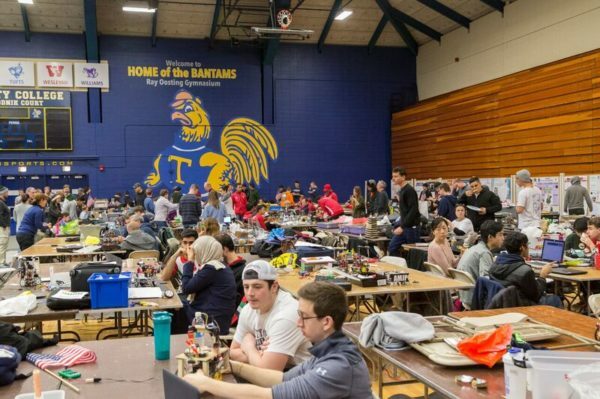 For 25 years the Trinity College Fire Fighting Home Robot Contest has brought hundreds of engineers and robotics enthusiasts from around the world to Trinity College and to Hartford. This contest promotes creativity and teamwork, it encourages the understanding and application of STEM subjects and serves as a mechanism to share ideas and break down social barriers. The contest encourages students, at critical moments in their educational pathways, in their pursuit of math, science, and engineering.